The "dirty" secret of PC peripherals is that the word "gaming" can often mean any combination of two things: robust quality and gaudy design. Most mechanical keyboards tend to be geared towards gamers, and likewise, most high quality mice tend to be pointed in the same direction. It's not unusual for digital illustrators to use one of the single-hand gaming keyboards for Photoshop shortcuts, and a good mechanical keyboard like the Corsair Vengeance K90 pretty much sells itself the instant a regular user feels the keys. Yet sometimes these peripherals don't feel like they were actually designed with human hands in mind. I've tested a few gaming mice that were definitely reasonably comfortable, but still clung resolutely to my aging Logitech G500. ROCCAT sent me two gaming mice to test, though, and I walked away seriously impressed. 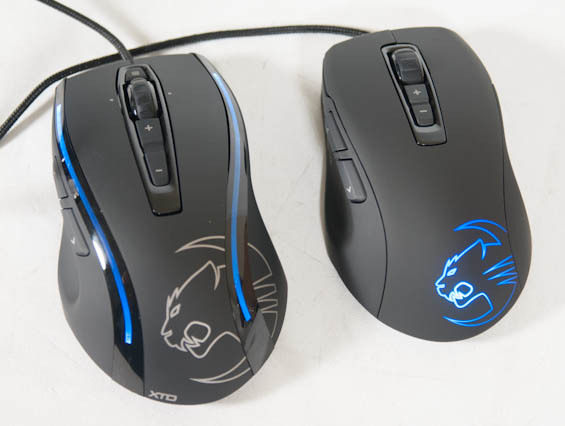 With the Kone XTD and Kone Pure, ROCCAT has two mice that are surprisingly comfortable and incredibly full-featured. Have I finally found a reason to retire my G500, and should you be looking for these? I know I'm not the only person who's picky about the peripherals they use. Once you know what quality feels like, it can be very difficult to just go back to a run of the mill keyboard or mouse (let alone monitor.) And sometimes, when you use one, it can just click in your mind: "this feels absolutely perfect for me." That was the moment I had with the Corsair Vengeance K90, and before that, the Logitech G500. It was the same confusing moment I had when I began to settle in with the Kone XTD and its little brother, the Kone Pure. Neither of these are ambidextrous mice. I'm right-handed, but most of my good friends are southpaws, and I kind of feel for them in that they've had to adapt to a world that hates left-handed people. Still, one of them has been using a tired old basic Logitech mouse for some time now, and when I handed her the ROCCAT Kone Pure, she was pleasantly surprised. The reason for that is because the grip of the Kone is designed to fit snugly in a broad range of hands, and importantly, ROCCAT dodges a big problem that I've found a lot of gaming mice have: poor texture. The soft touch plastic treatment that Razer and some other peripheral manufacturers tend to use doesn't breathe at all, and I've found their mice to cause my hand to sweat and perspire much worse than other mice. 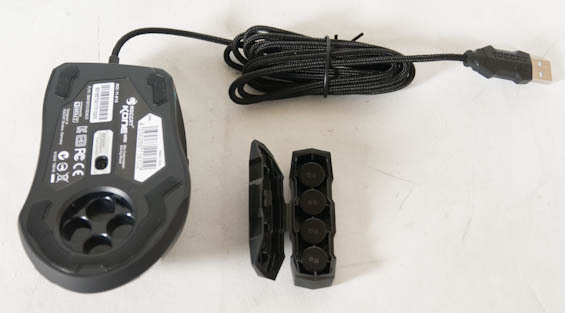 In comparison, the treatment on the surfaces of the Kone mice is more conservative. The glossy plastic that houses the LED stripes on the Kone XTD will undoubtedly be a sweat magnet, but the majority of the surface is quite comfortable. While the XTD and Pure are clearly related, the Pure is the cut down version. Both feature a rainbow of configurable LED lighting (typically tied to the active mouse profile), along with DPI adjustment buttons below the wheel and back and forward buttons on the left side, beneath the thumb. They also both feature a laser sensor rated for 8200 dpi. Where they diverge is in the additions to the XTD: a button above the mouse wheel, left and right tilt on the mouse wheel, and customizable weight. Disappointingly, the door on the XTD for the weights is a little bit loose. This review feels like its more of a general user opinion of the mouse rather than a review. I didn't read anything about the mouse buttons. Are they responsive? How's the tactile feedback? Do you accidentally press them when resting on them? Do they have a loud and annoying click like most of the mice out there. I want to know this stuff for front and side buttons. How about the mouse wheel? How stiff is it? Does it have very strong notching that fights you, is it too loose and not accurate enough, does it feel tightly set into the body without any extra play or jiggle side to side, does the click-in require excessive force which could tire out your middle figer during a long Maya session? How about glide feet? Does it glide easily on a hard mouse pad, cloth mouse pad, desktop surface? Does it have tracking issues on any surface type tested? Are they replaceable? How much? Any special treatment of the mouse cable? How do different users with different grips feel about it? Claw grip, palm grip, etc. feet are bad too, and I had the original 5 feet. I probably just missed it in the article, but can this be changed"
>> "Users are liable to be confused by the back button being used for "Easy-Shift" instead, but that's a minor grievance." I held to my MX518 for a long time and the replacements I tried never stayed home for long. Then I got the Kone XTD and I was blown away! I totally love the mouse. About the settings...you need to upgrade it and the changes are instant. I did it and I can tell it works so it was a firmware upgrade needed, nothing else. For the people who have issues with this article, you guys do realize this is a capsule review, right? It's not going to get very or granular or technical. Is your opinion that AnandTech should stick to more thorough reviews and skip the lower calorie capsule reviews entirely? The review has no contents, its not a review its a user opinion piece on irrelevant details. Why are mice so expensive? You'd think 2ndary players would fight on price, but they don't really do that. A mouse has just a bit of electronics, and whether the plastic mold is this or that shouldn't matter much. There are a few extras that cost most to produce, but $40-50 for a good mouse seems overpriced. Half the price makes more sense to me. Below are some random Chinese mice on eBay for $4-9. Anyone thinks Logitechs cost 10 times more to produce? And, why aren't wide scroll wheels common? ...because I paid $55 for my Razer Naga. Not the silly green or red ones, not the Hex crap, either. The regular, blue, original classic. The great one.